Epoxytec Mortartec Hydrxx-1 is a rapid set (1-minute), hydraulic cement compound designed for structural patching, and as a leak stopper and water plug, which instantly stops running water and/or seepage through concrete or masonry walls and floors. Packaged in dry powder form, Hydrxx-1 requires only the addition of clean water to make it ready-to-use. Epoxytec Mortartec Hydrxx-1 contains no metallic fillers, will not shrink or oxidize, and seals. Hydrxx-1 is designed for an ultra-quick reaction and sets in 60 to 90 seconds, depending upon the temperature of the mixing water and the surface onto which it is applied, and the mass. Low temperatures will retard the set-time. Higher temperature will accelerate the set-time. Mainly, but not limited to, grade and subgrade applications – plugging holes, cracks, faults causing leaking and seepage through concrete floors, walls and junctions, general masonry, around inserts such as sleeves, pipes, etc. suitable for any similar architectural or structural concrete application – pits, mines, tunnels, reservoirs, sewers, cisterns, canals, lined ditches, miscellaneous grouting & spot sealing, bolt hold downs, etc. Remove all loose concrete, brick or mortar from affected area by mechanical means. Surfaces shall be free of paints, oils, dirt, dust, curing compounds, sealers, form release agents or any material that would prevent mortar from coming into contact with the open pores of the concrete. Shot blasting, sandblasting, chipping and high pressure water blasting (3,500 psi) are all excellent surface preparation methods. Smooth concrete surfaces may require etching with muriatic of sulfamic acid, then thoroughly cleaned with pressure washer. Dampen area to achieve a saturated, surface dry condition (SSD). Leaving no puddles. 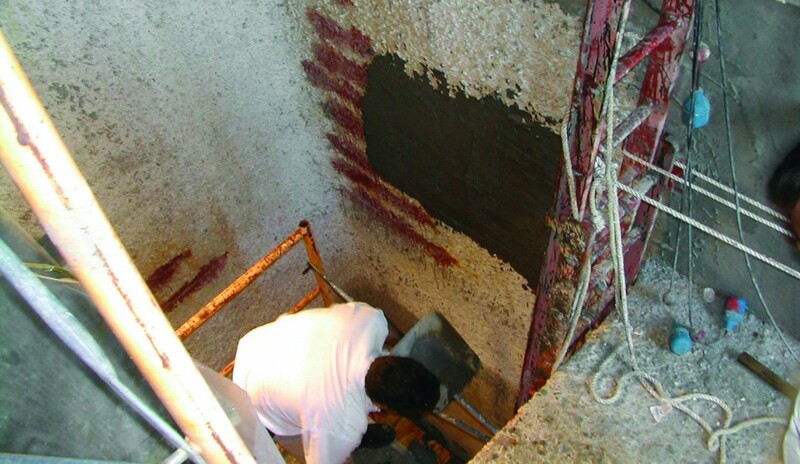 Applying Mortartec Hydrxx-1 is usually a two man job – one mixing small batches and the other placing the material quickly and holding it with pressure until water seepage stops. Force the mixed Hydrxx-1 into the crack or hole using maximum pressure. When areas of high water pressure are encountered, hold the Hydrxx-1 in your hand until you can feel the heat generation (the use of gloves is recommended). Immediately push and force the material into the opening and hold firmly in place with palm, trowel or wood block until set. Then shave the surface flush with a sharp pointing tool, knife or trowel. Plug a long-running opening or crack with successive small rolls of Hydrxx-1. Optimal build is between 1 – 4 inches. Shelf life: 12 months, sealed. Storage: Store in a dry area away from direct sunlight. The product should be conditioned to between 70º F and 95º F before use. Epoxytec Mortartec Hydrxx-1 is a rapid set (60 seconds), industrial-grade hydraulic cement compound designed for structural patching, and as a leak stopper and water plug, which instantly stops running water and/or seepage through concrete or masonry walls, ceilings and floors. This easy to use material simply requires a handful of either slightly moist-mixed or just dry material, held in place while the leaking water reacts with it. It is so simple to use, that often times it provides a substitute to more difficult and dangerous chemical grouting, point repairs, and other injection type leak controls, fixes and prevention. Terrific for underground mason or concrete structures where due to the porosity of concrete, joints, or deterioration the structure is weeping water or leaking. Popular for controlling and stopping leaks in manholes, access structures, grease traps, sub-grade vaults, pipes, pump and lift stations, and other collection or flow distribution systems.